Travels of Marco Polo: The Prologue part 1 | Histastrophe! Marco Polo. Proclaimed “wise and noble citizen of Venice”. They knew him for his families travels to Constantinople and further Asian excursions. We know him for being the subject of an awesome pool party game. I know him for teaching me to never trust 10 year olds because I swear those little bastards were peeking. For the most part, though, people know who he is. He’s that Italian dude who had adventures in Asia or something. Oh, and he was on an episode of Doctor Who. 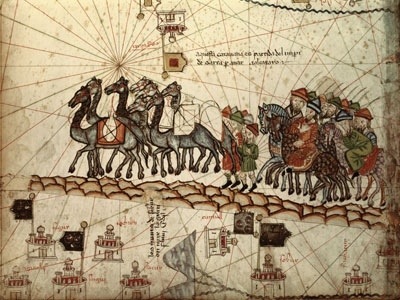 But he was also the “author” of The Travels of Marco Polo, a book that famously introduced a narrow European world to the culture and life of their eastern brothers and sisters. Technically, Marco dictated his stories to Rusticello da Pisa, a writer and, well, prisoner. They were in prison together. I’m crossing my fingers for a Morgan Freemen narrated Italian brofest that leads to epic book writing and a trip to Mexico. Unfortunately, none of the original text still exists, so as my nerdy heart cries over the loss of an irreplaceable relic, what we have instead is a messy bunch of editions and alterations that when collected equal a tremendous potentially embellished tale of travels through Asia, Persia, China, Indonesia, and speaking terms with Kublai Khan. And they could all very well be fabricated bull. Despite that, The Travels of Marco Polo is a well-known primary source and if it wasn’t riddled with bias and error it wouldn’t be any fun! Regardless of what Rusticello says here, ignore him. There were about 150 different versions and if anyone knows anything about the telephone game, sometimes “I like cats” becomes “Cindy has herpes”. So, with only one small down payment of 500 Augustals, this information can be yours! Send all payments along with the messenger Scammy McScamkins before the next Crusade! No refunds. Also, what are a “women”? And, side note: Marco Polo spent 67 years exploring. I have nothing to say to this other than to shut my book for a moment and take a respectful bow. He just barely beat out Indiana Jones on the old codger leader board. The year was 1260 when Marky Mark’s father, Nicolas, and Uncle Maffeo were chillin’ in Constantinople (modern day Istanbul if you aren’t friends with me) as merchants when they realized the gettin’ was better somewhere else. Probably true, honestly, this would have been under the reign of Baldwin II who was practically going door-to-door to various kingdoms begging for money. He’s probably more known for selling off the Crown of Thorns, you know, Jesus’ fancy kingly only-used-once-so-almost-brand-new headgear, than being the last emperor of a Latin constantly limping along Constantinople. First they went to Soldaia, an integral Silk Road trading post and Tartar punching bag, and than decided to hang with Barca Kaan, a Tartar prince in Sara. …I mean…you guys, it’s a city. A CITY. Turns out, Princes love them some jewels, so after a generous gift, the three of them got on famously for a whole year until Barca barked up the wrong tree in a war with fellow Tartar lord, Alau. Not wanting to get captured or blood on their pointy shoes, the Polo brother’s journeyed onward to Ucaca, then passing the Tigris river (famous for cradling Babylon with the Euphrates river) ,and than on to an unnamed desert. Then they showed up in Bocara whose king was Barac and okay this is getting confusing. Anyway, they stayed in Not-Obama’s city for 3 years. Not having the heart to tell them what a pestilent conquering awkward dancing people the whites are, the brothers agreed to travel to the court of the Great Khan! Pingback: The Travels of Marco Polo: The Prologue Part 2 | Histastrophe!